At a public meeting this Tuesday in Viljandi, Riigikogu member and a leader in EKRE Martin Helme pointed to an additional problem with Marina Kaljurand as potential presidential candidate: not limited to being backed by Reform Party, she is by nationality a Russian. «I do not find fault with Ms Kaljurand for being Russian, but I do not think a Russian could be Estonia’s President. There is a country in the world already where a Russian is President,» said Martin Helme to the audience. He underlined such topics should be treated without false humility. «Marina has never concealed her roots. Neither do I see a need to conceal my opinion,» said Mr Helme. Honorary Chairman of EKRE and former President of Estonia Arnold Rüütel condemned the opinion of Martin Helme. «I think it is not right to attack like this,» said Mr Rüütel, adding Mr Helme attacked Ms Kaljurand too personally. «Such behaviour does not correspond to my values,» said Mr Rüütel. 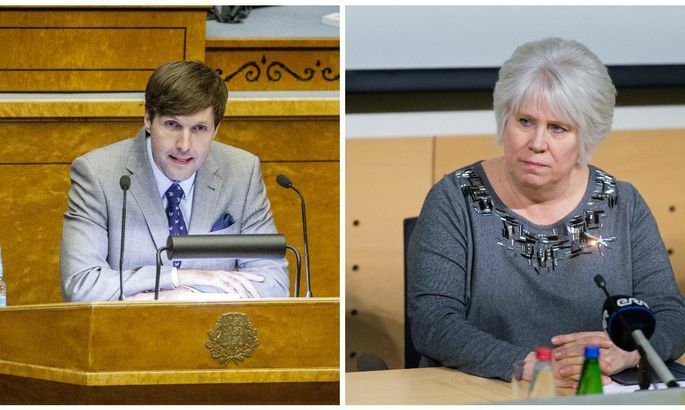 Marina Kaljurand expressed regret at the statement by Martin Helme and assured she had always stood for Estonia’s interests. According to Marina Kaljurand, the political activity of Martin Helme rather resembles the attacks of aforementioned Russian Nashi than a behaviour becoming of a member of a parliament of a democracy. «Mr Helme and his gross rhetoric may not alter the behaviour and attitude of me and others in Estonia. We may not listen to their threatening and scaremongering. I remain a citizen of the Republic of Estonia who defends and worthily represents the interests of the Republic of Estonia both as foreign minister and as citizen,» said Ms Kaljurand. According to Ms Kaljurand, statements of the likes of Mr Helme would not affect her decisions including running for President. «I listen to, take council with, and consider the opinions of people who, I respect and whose opinion is important to me. Mr Helme is not among those people,» noted the foreign minister. Commenting on the rhetoric of Mr Helme, political scientist Rein Toomla recalled that the issue of nationality has in various forms surfaced at earlier occasions as related to presidential elections, while thus far remaining a rather unimportant side issue. He thinks it is a new level this time as nobody had deemed it becoming to attack a potential candidate for nationality. «This for sure is a new thing,» he said. Asked why a leading politician would resort to such tools Mr Toomla said this could be the pragmatic calculation of such principles being liked by many, it being for them a matter of principle that parents of some minister or President are not Estonians. «While forgivable for a voter to stress such things, politicians should be much more balanced. Naturally, nationality or cultural background ought not be at centre of elections. Otherwise, at one point we will be saying such and such does not qualify being a woman or one-legged. The entire discussion should boil down to whether in office an individual would pose a threat to Estonian state and I am sure that even Martin Helme agrees that Marina Kaljurand poses no threat tour state,» mulled Mr Rein Toomla. A MEP from Centre, Yana Toom thinks Martin Helme’s statement to not be the first one that crossed the ethical line. «I am for Estonia to have an established political nationality. And, viewed from that angle, Marina Kaljurand is definitely an Estonian,» said Ms Toom.